Bbut I won’t let you go without any science this time either. There is always things we can learn. How about the bullet peeking out of the barrel but still attached to rifles? 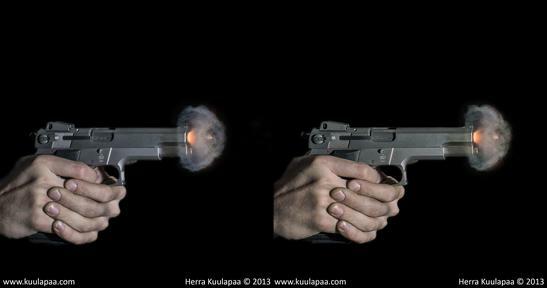 A true example of change from internal to transitional ballistics. 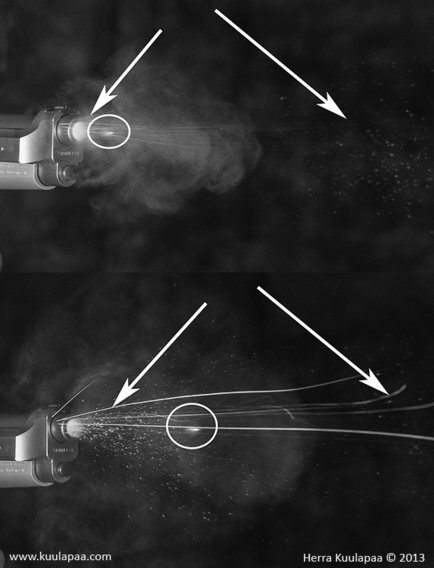 In the pictures below way we can see how the massive pressure of hot burn gasses behind the bullet is leaking out between it and barrel wall. 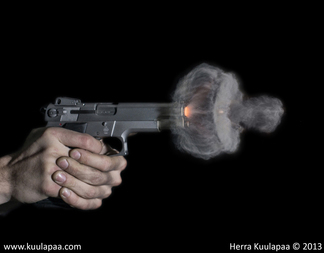 Bullet is however blocking the barrel containing pressure inside it. 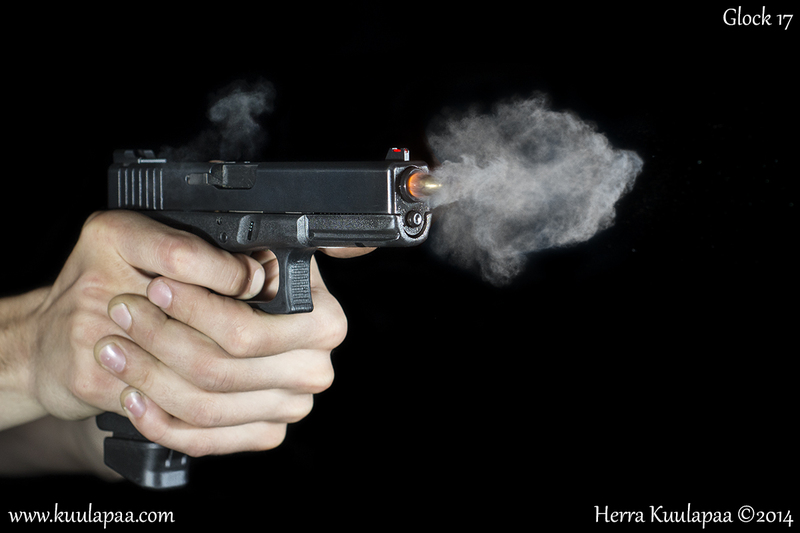 Another typical thing for autoloading pistols is a small gas burst from the chamber when slide has moved slightly. Movement has enabled casing to get slightly loose inside the chamber, which creates a opening for gas. You can also get a lube splash visible in some pictures depending how much you use it. 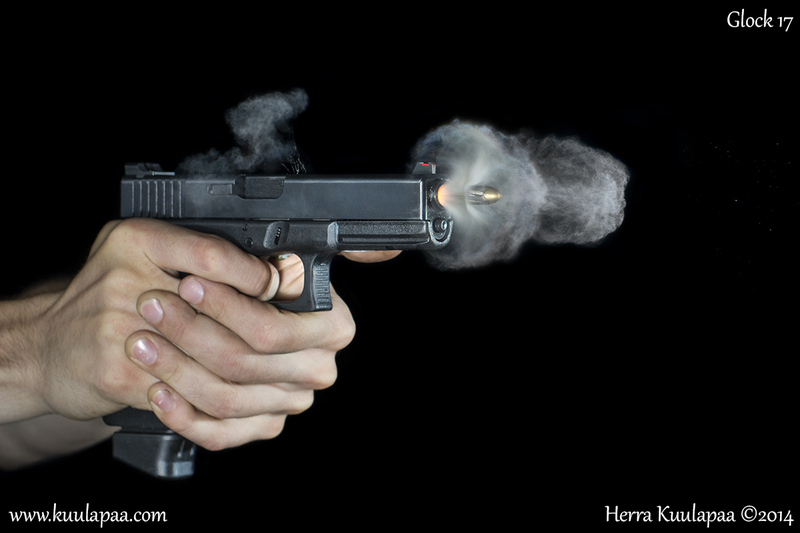 This site emphasizes importance of firearm safety and proper handling of firearms. Weapons are not toys and they should never be considered neither treated as such. We do not respond to any communication attempts involving suspicious politics, racism or general hate talk. If you agree please continue and enjoy our work! 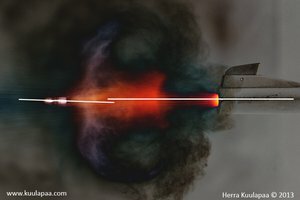 When bullet finally separates from rifles the hot gas can freely expand but it can do it only into one direction with high velocity. 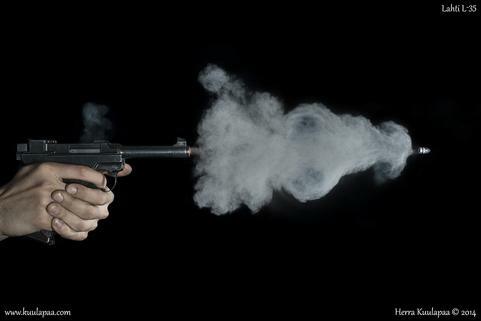 Are the gas molecules inside the closed barrel still or are they following bullet already having the same velocity – there are two different schools of thought on this. Either way when path is clear then the gas rushes out with high velocity. 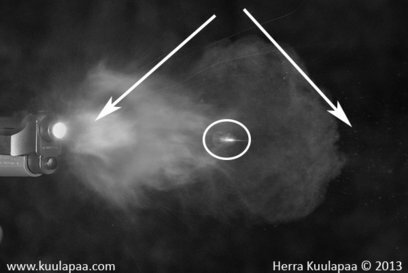 Escaping gas creates a typical cone shape blast formation behind the bullet. But the pictures and information in them, can we make a symmetry assumption or even an estimate based on blast pattern? I believe we can. 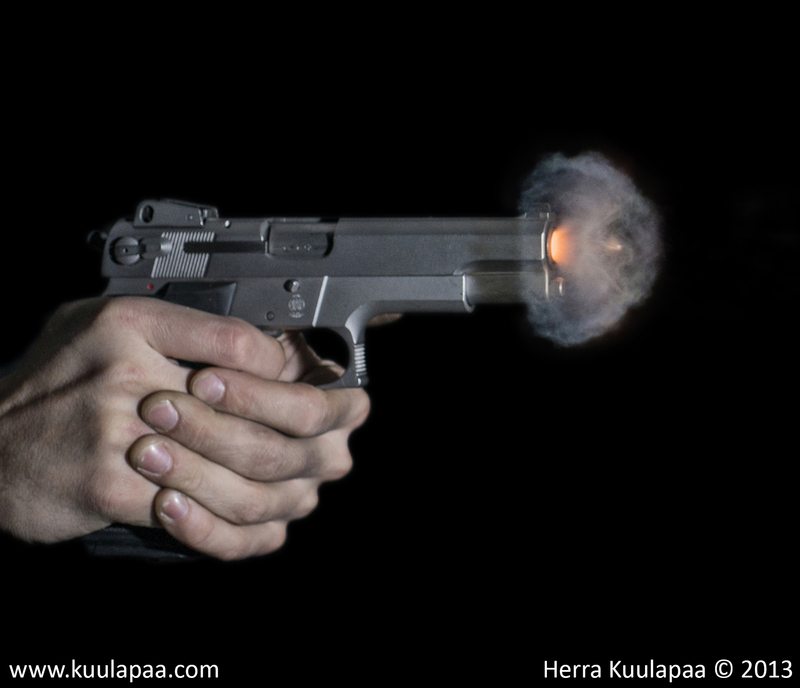 If the cone is symmetric then it should also imply to clean and even separation of the bullet. But what if we had a bad barrel with clear dent on the head or low quality deformed bullet tails? A picture taken during that exact moment bullet is separating from barrel with one side releasing gas and other ones not - Maybe someday we can study that. It has been a while since our last range visit (with guns and camera). Reason for the break was that we started updating our camera system during the spring and unfortunately everything didn't go as smooth as planned. But now things are back on track and gear is again willing to talk each other. This upgrade should improve the image quality even further and we are really looking forward to get back to range and shoot more material. 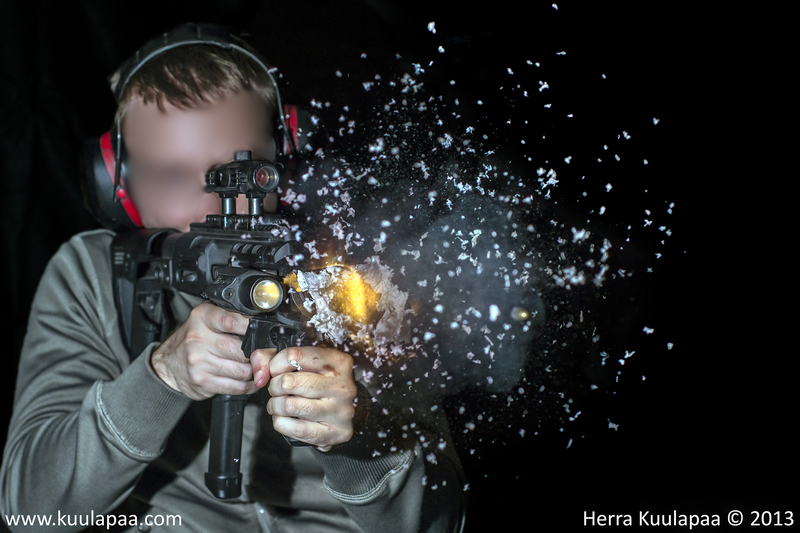 This was practically our first session with the new gear and we chose to shoot classical and nowadays pretty rare pistol with it. 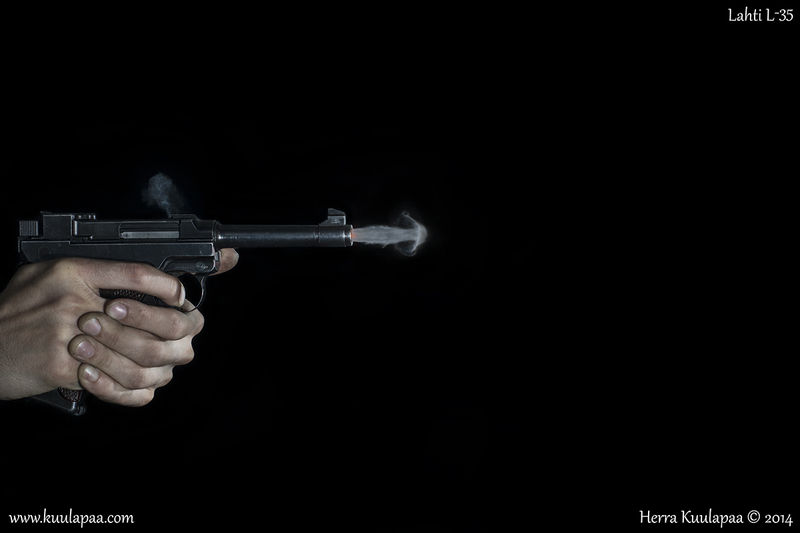 It's called Lahti L-35 pistol designed and developed by Aimo J Lahti in 1929. This specific pistol was successfully used in Winter war to defend Finland against Soviet Union attack. You can read more about the gun in Wikipedia. 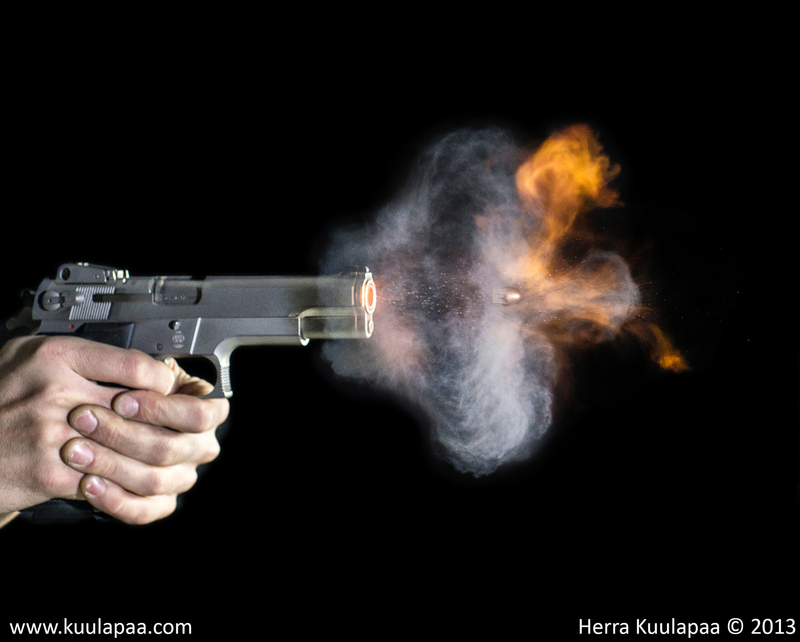 Ammunition was old military 9mm rounds with rather mild load, which can been seen as missing muzzle flash flame. Interestingly the whole white cloud has a life time of only few milliseconds so you really cannot see it by naked eye. I'm happy to present you some promo material we did for Helsinki Shooting Club (HSC). 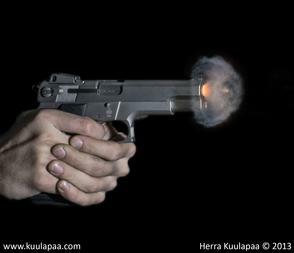 Gun in the first image is CZ VZ61 Scorpion - a semiauto .32ACP pistol. 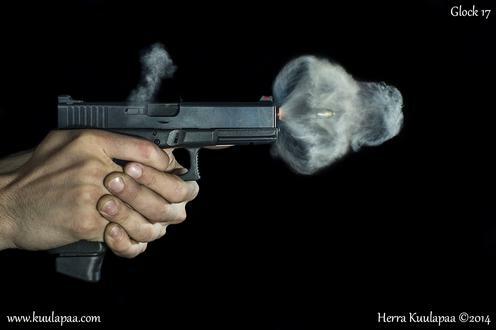 Mild recoil, not much noise and very little muzzle blast flame compared to larger caliber pistols. Scorpion is constantly visible in movies and TV-series. Perhaps the most famous is the Matrix lobby shootout where Neo shoots two of these pistols with flood of .223Rem casings. Lady in the picture right hand side shoots .357Magnum with nice pink grip. Unfortunately the grip isn't well visible. Bigger revolvers on bottom are S&W Competitor models chambered .44 Magnum. Like in our previous projects have shown the .44 Magnum has a built in "flame guarantee" and it didn't let us down this time either. 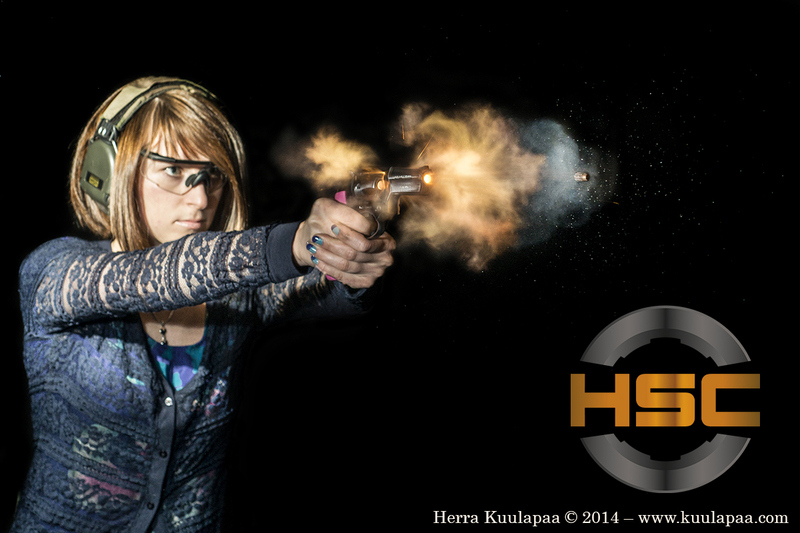 As always a word of firearm safety - Notice the eye and hearing protection. Guns overall and especially revolvers direct blast of high velocity particles towards the shooter. They can really damage your unshielded eyes. Do you remember Miami Vice? Of course you do, a silly question. This is Smith & Wesson SW 645 .45ACP single stack pistol model, which James "Sonny" Crockett used for couple of seasons before upgrading it. Interestingly 645 was produced only for couple of years before S&W updated it. Some people say that there were reasons behind the fast update cycle but I think it's not that bad. Well, to be honest there is something quite bad in it and that's the trigger pull, which is really long without clear feeling of break. I've been asked to provide normal 2D images every time 3D is posted so that people with eye injuries or just unable to view them can also fully enjoy pictures. Below you can see 3D stereo pictures of the same stuff. Those stereo pairs reveal so much detail about the structure so I'd recommend viewing them. Just remember to click them big. There is a example picture of the slide movement on the right. As you can see the bullet is roughly one barrel lenght away and slide has already moved a bit. 7. 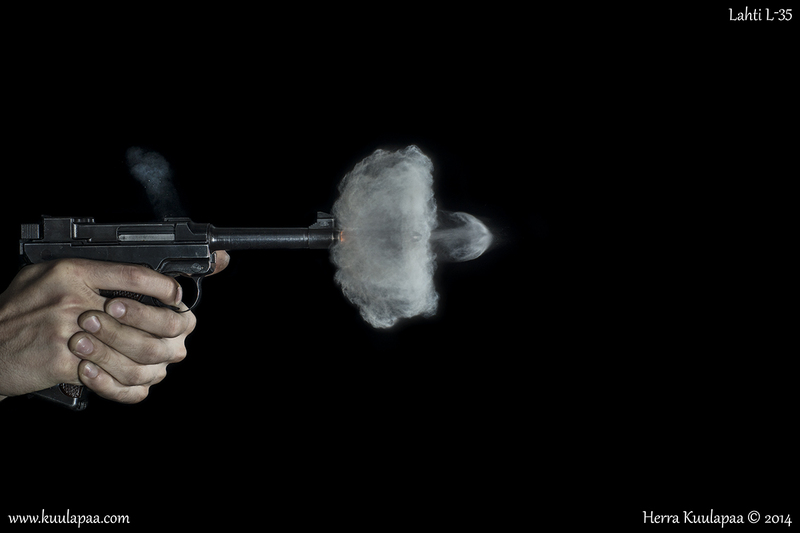 October 2013 - Next dimension of high speed photography: World first 3D high resolution ballistic photography. I'm proud to present you our next development step: We have discussed a lot about bringing more depth to our pictures and this is how we do it. 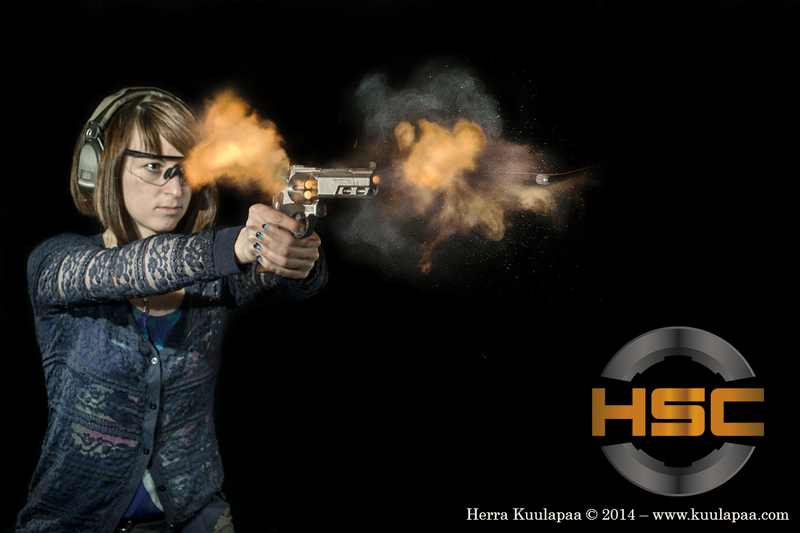 We bring you real 3D experience of enjoying Herra Kuulapaa high speed ballistics photography. 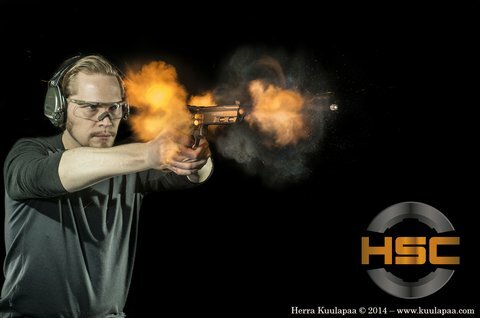 This is the first time high speed ballistics photography is presented as high resolution 3D. 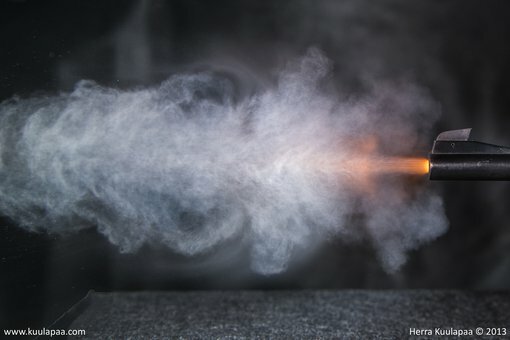 Bullets flying and high pressure gas cloud floating in the air are nice to view at 2D but when you view same as 3D stereo pair you realize whole another dimension in them. Enjoy, more is coming soon! This is Roni G1. 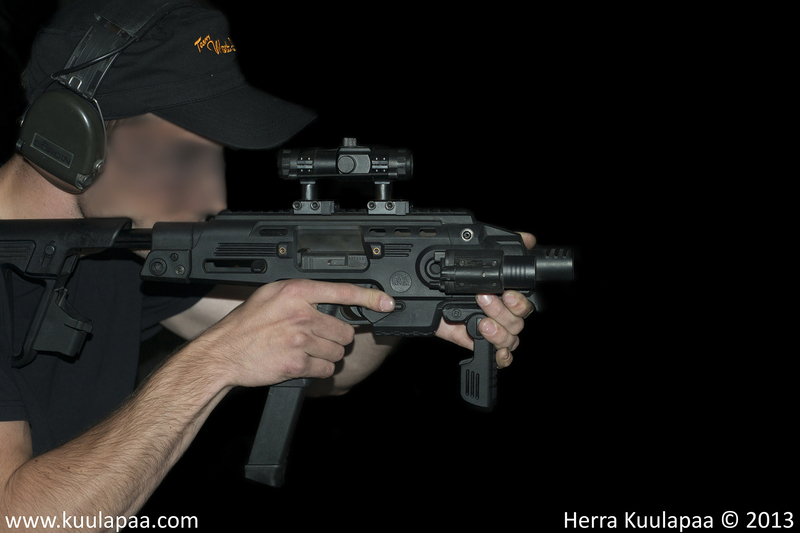 A carbine conversion kit for Glock by CAA Tactical. 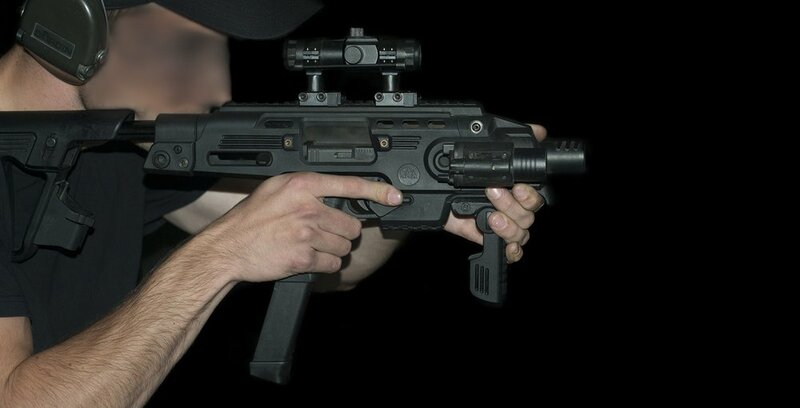 It's a interesting modular concept, which can be built around your standard pistol making it real tactical carbine. This is 9mm conversion version and it is equipped with additional gear like red dot sight, laser, tactical light. 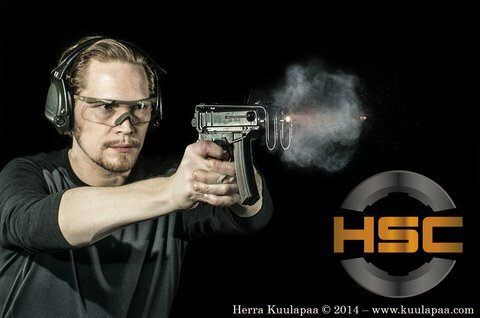 So, it's not just a pistol anymore although it's classified such in many countries including Finland. Key point being that it can be out together and dismantled without any tools. How it makes the handling then? With low recoiling 9mm rounds and good grips the handling is nice. Also retractable stock makes gun feel solid. 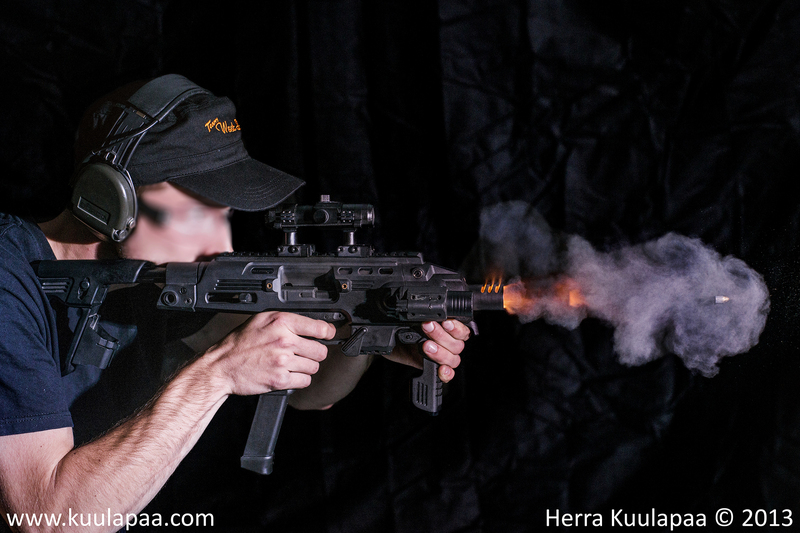 In pictures you can see the muzzle flash hider push some flames up but still there is plenty of stuff going forward. Overall this conversion kit delivers what it promises. Go try it out with West Shooters. Time to present you more results and this time we got nothing less than legendary Colt 1911 .45ACP. I’m sure this piece of history needs no introduction but for those who are not familiar with it I can say that it is one if not the most iconic self loading pistol all time. Especially for US guys but elsewhere too. It has long history and yes, 1911 stands for the year. Like previous tests have shown used cartridge makes large effect on muzzle flash and particle cloud. For 1911 we used Magtech 12,6g (200gr) lead semi wad cutter (LSWC) and like previously there are unburnt particles visible. Theory however says that lead bullet seals barrel better than FMJ and that may reduce spray. 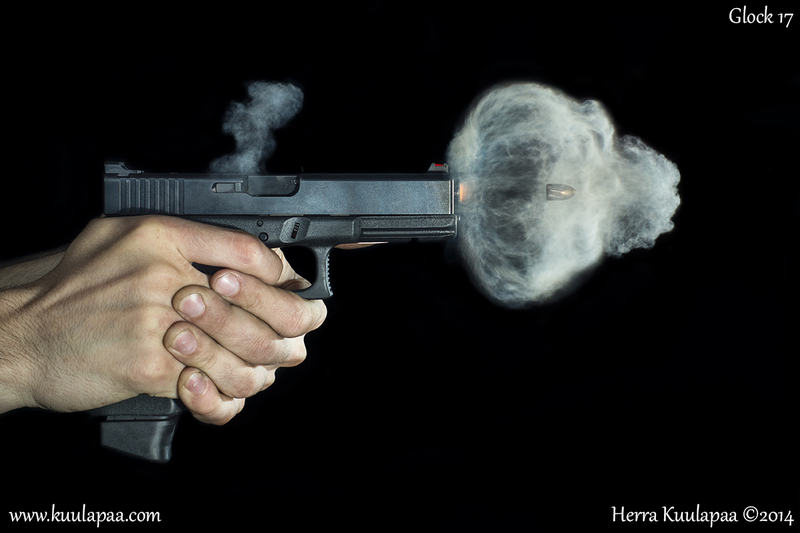 Cloud of smoke is very predominant and somewhat thicker than with 9mm. I’d expect this difference to be clear on forensics point of view. There also seems to be a bit more glowing particles than with 9mm. 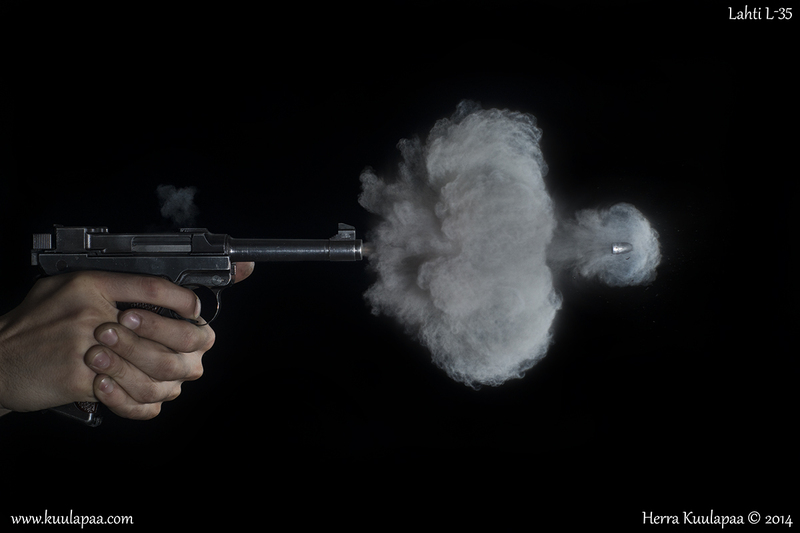 Pistol itself is not much visible behind cloud and you just need to trust on us that it is there. 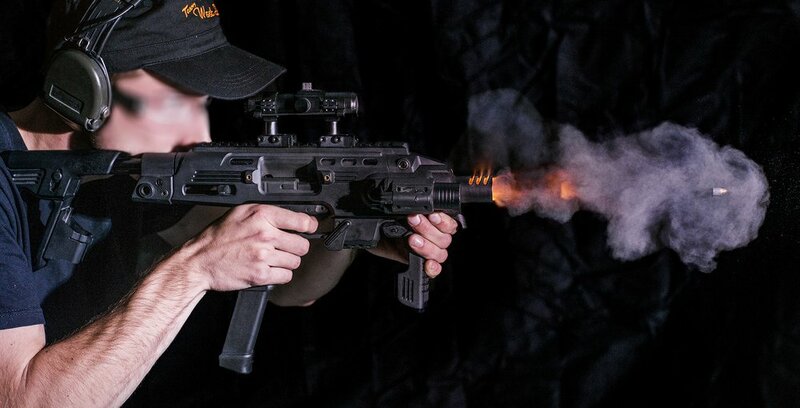 Muzzle flash seems to be, at least with this Magtech, quite mild. 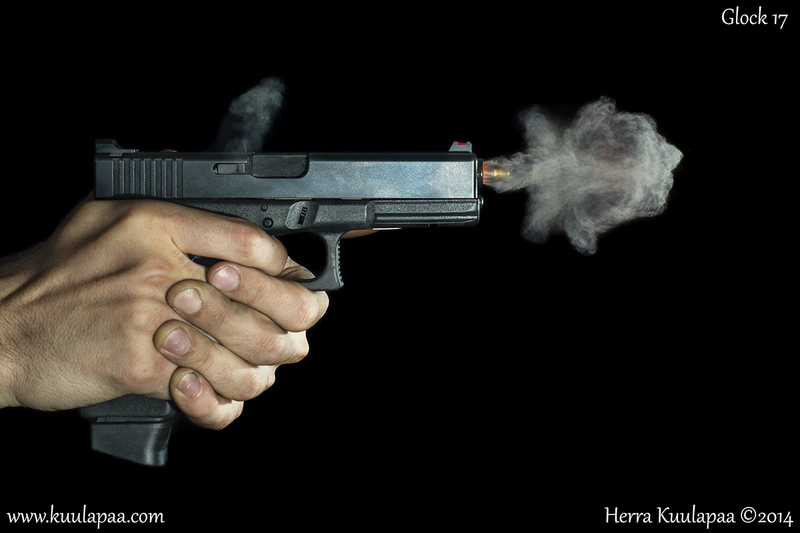 I’d estimate that CCI Blazer Brass with 9mm makes bigger visible flash than this .45ACP. 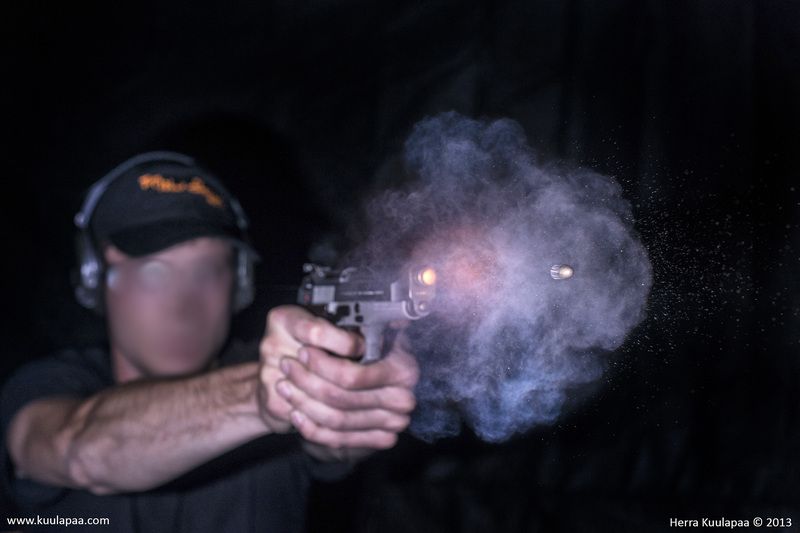 Both some and flash characteristics may have something to do pressure difference between 9mm and .45ACP, where latter run roughly half of the pressure of 9mm. Just look the barrel thickness of 1911 and you know what I mean. 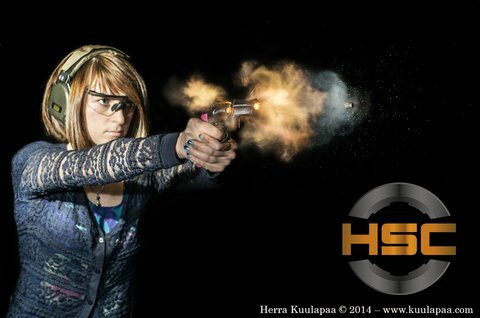 Safety first: Remember to wear your safety gear always when shooting. 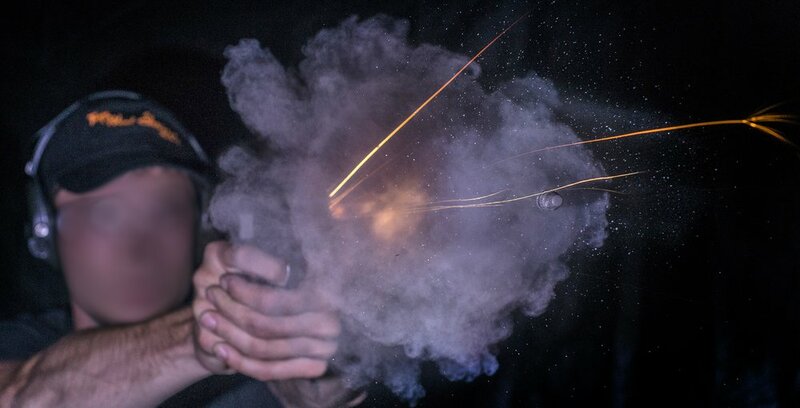 Some pictures show clear burning particles flying backwards to shooter! Small dose of educational content. In masked man picture below you can find big spray of unburnt powder and other residue. This is same effect with earlier 9mm STI Edge pictures. There are some differences though. There is picture pair on left shot with Magtech. In upper picture of them you can see prebullet residue cloud that is mainly left there by previous shot. Residue is now pushed forward by pressure traveling ahead of bullet and gas leaking between bullet and barrel. After bullet comes second, larger particle cloud and that is originated of shot itself. In picture above you find different kind of powder burn behavior. That is shot with CCI Blazer Brass. 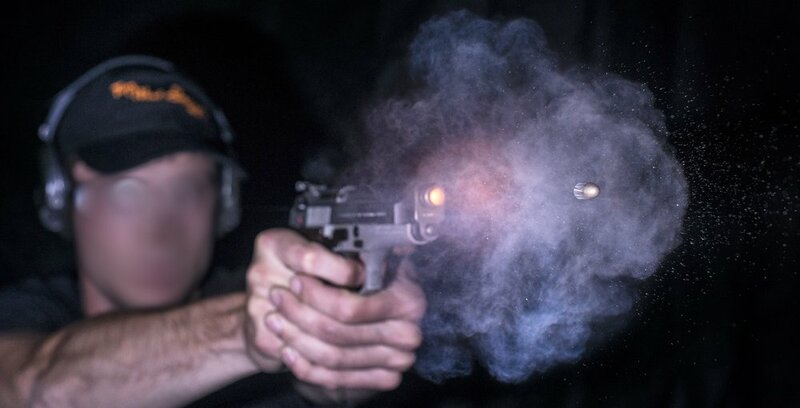 Typical for this cartridge is pretty massive visible muzzle flash. 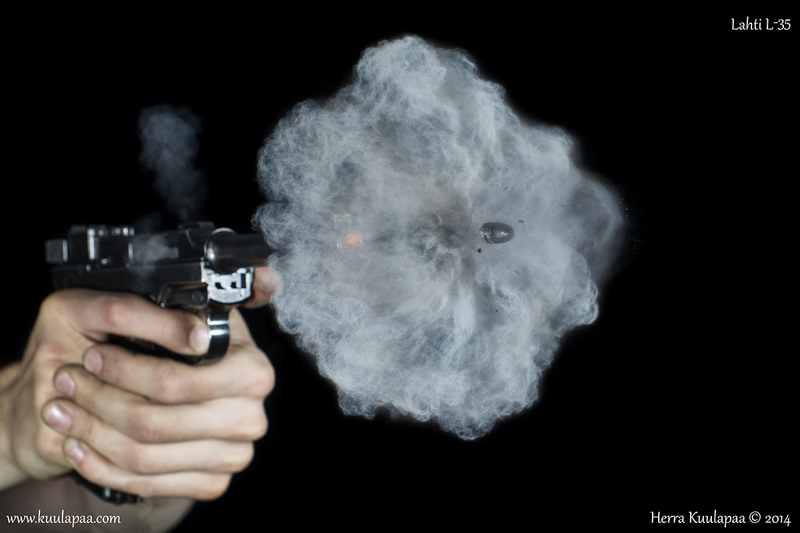 Interestingly that flash is actually caused by powder still burning when bullet exits barrel. Flash is eating that residue and rear particle cloud is significantly smaller. What this means then? 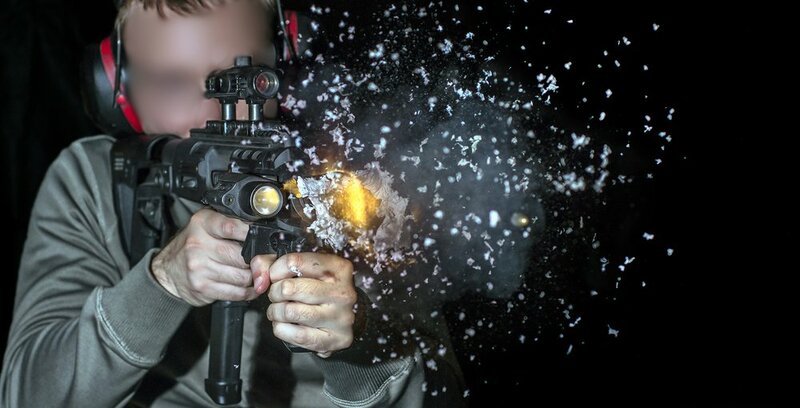 Well, there should be little less cleanup to be made if you are shooting indoors. What can we learn: Powders are different and remember to use your safety goggles. Why do I like so much small caliber .22lr? It's so modest, well controlled and you can do very precise things with it. You know what I mean. That small lead bullet makes good seal for powder and lets it burn without spaying it shot gun like what happens with 9mm. 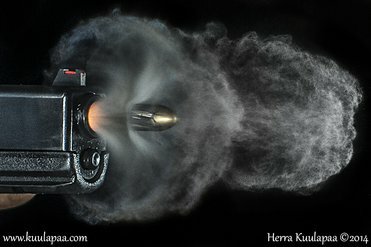 These are pictures of my friend's pistol. Old Browning Target model but manufactured under license by Belgium FN. I can say it's really good gun to shoot with. Not a real competition pistol but a good gun. He asked me to take some pics of it and make them look good. As good as .22lr can be done so here are the pics. I think they came out quite decent. 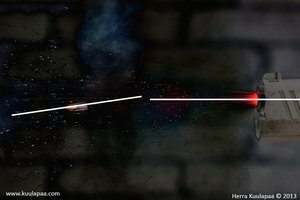 You may have noticed that bullet seems to be tilted in certain pictures. 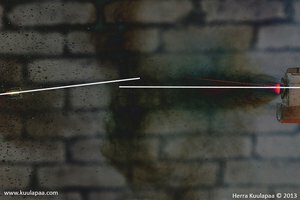 Barrel angle may be slightly off horizontal axis in some cases but bullets really are tilted. Well, they're not actually tilted in any fixed direction as they rotate and wobbling of the bullet is dynamic during flight. 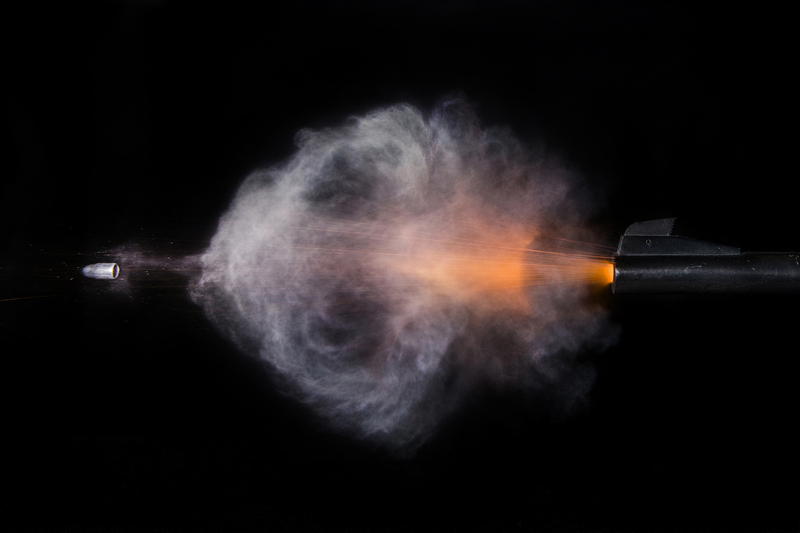 In other words bullets can either stabilize or tumble during their flight. 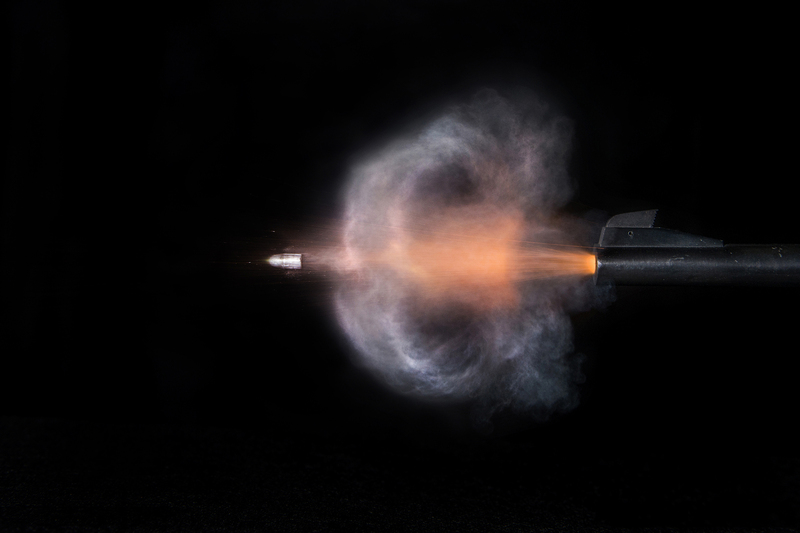 Pistol caliber bullets often tend to wobble when they leave barrel and theory says they stabilize during flight. 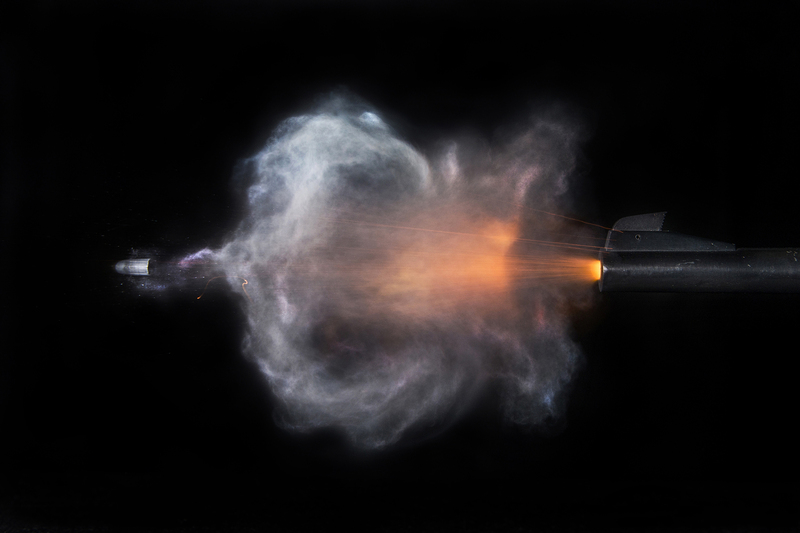 These images show you how much bullets actually can wobble. How much smoke is too much? 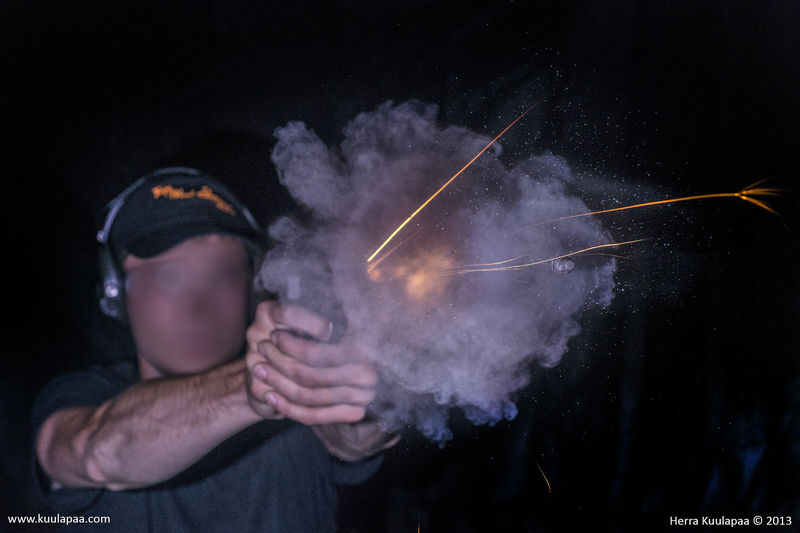 Nothing beats black powder pistols, right? Well, I guess not, but what you're looking at is once again just .22LR. What in earth is that cloud of smoke then. Answer is the Remington Thunderbolt. It makes smoke like nothing else. Picture is little boosted to make those fine structures visible but not much. CCI standard is a pale comparison. But surely Remington Thunderbolt makes good bunch with higher velocity? 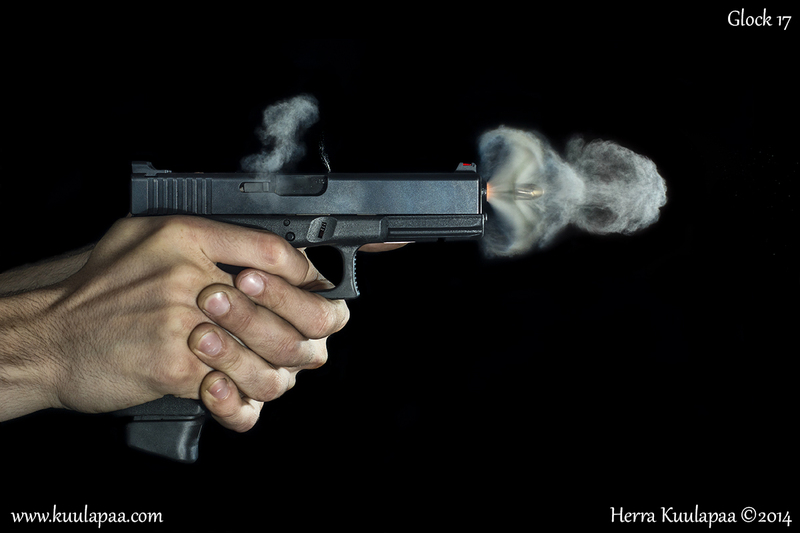 It does, on average but if you shoot pistol then it may not be your number one choice. Why, you ask? Because by my experience and based on test results performed by shooting range friend there was no .22LR cartridge available with higher variance on pistol muzzle speed than Thunderbolt. It is important to notice that it may function differently and much better in rifle but in pistol muzzle speed variance between slowest and fastest shot was high = ~58 m/s (189fps) n=50. 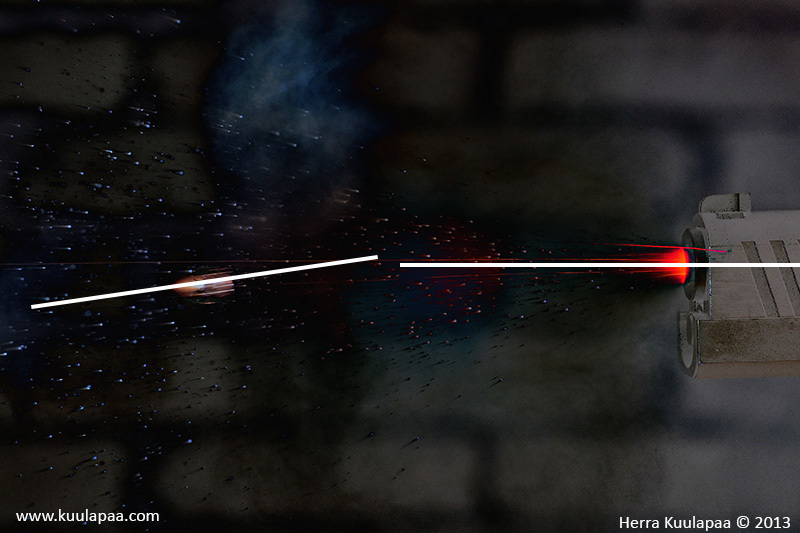 Slowest shot was 260 m/s (855fps) and fastest 318m/s (1044fps). Statistical parameters were Avg=301,7 m/s (990fps), Median=303,5m/s (995,7fps), Stdev=9,64. It kicks good and makes loud bang and smoke. Even a bit too much.